At temperatures around 15°F and higher, Winter Melt® Ice Melt Salt sets the standard for winter ice melt by melting more ice than its expensive counterparts. Made with pure salt, Winter Melt® Ice Melt Salt is the natural choice to melt ice in temperatures as low as 5 °F / -15 °C. Always a cost-effective way to maintain your driveways, sidewalks and walkways on icy, cold days. And depending on the strength of a storm, or how strong you feel on that particular day, it comes in a variety of convenient sizes for the job at hand. Winter Melt® Ice Melt Salt features a unique blend of large and small melting Sodium Chloride crystals working in combination to melt ice quickly, and then keep it melting, long after application. Directions: Remove slush and as much loose snow as possible before ice melt application. 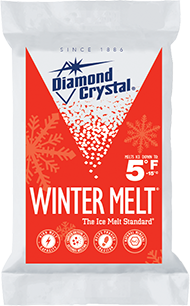 Spread Winter Melt® Ice Melt Salt evenly across surface area. Apply ½–1 cup per square yard using a scoop, depending on ice thickness and air temperature, as needed. Reapply as necessary. When ice and snow soften, remove slush and any excess ice melt from pavement for good concrete maintenance.